The fiber material of carbon fiber is twenty-first Century the most attractive fiber,It is known as the "king of new materials". It is lighter than aluminum, stronger than steel, its density is 1/4 of iron, It is the strength of the iron 10 times. Carbon fiber has high modulus, high strength, low elongation, low density, high abrasion resistance and superior conductivity, etc. According to the purpose and different kinds. Carbon fiber is divided into viscose fiber, asphalt base fiber and polyacrylonitrile fiber. The main manufacturing enterprises for producing carbon fiber in our company are Shenyang Zhongheng New Materials Co., Ltd and Jiyan High-tech Fiber Co., Ltd from Jilin City. Shenyang Zhongheng New Materials Co., Ltd., the leading products are PAN-based precursors, carbon fibers, panof fibers, oxygen-enriched fibers, carbon felt, oxygen-enriched cloth, and other carbon fiber products. 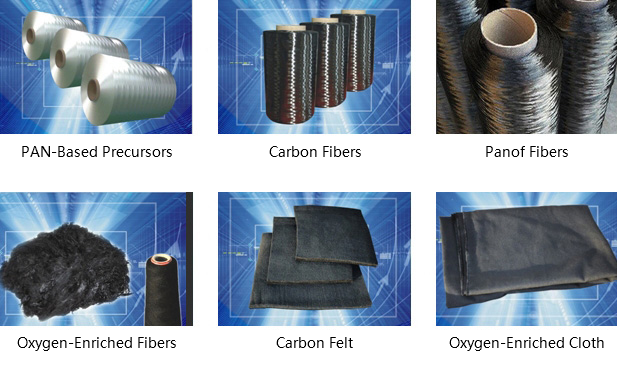 Jiyan High-tech Fiber Co., Ltd., the leading product is PAN-based carbon fibre, PAN based carbon fiber cloth, Viscose rayon based carbon fiber, and can produce chopped carbon fiber, Carbon fiber powder, carbon fiber rope, such as the back of the products, it provides quality carbon fiber products to more than for domestic enterprises. The products are widely used in aerospace and other high-tech fields. The leading products of Jiyan High-tech Fiber Co., Ltd is annual output of 20000 "JiHaoLin" carbon fiber composite material of bicycle. The carbon fiber bicycle of "JiHaoLin" has firmly established itself as one of the top domestic carbon fiber bicycle.